The end of summer / beginning of autumn is a time when we look forward to masses of cheap tomatoes from the market, or free tomatoes from our gardens. Unfortunately, if you've had a poor summer (I live in the north of England, so that's pretty much a given) and don't have a greenhouse, your tomatoes may not ripen. But don't worry, you can make this wonderful chutney! Wash the tomatoes and cut off any grotty looking bits. Halve the smaller ones, quarter the large ones. Peel and finely chop the onions. Finely chop the apple, but leave the peel on (this will provide pectin which will help the chutney set). Throw all ingredients into a large pan and add enough water to just cover everything. Bring to the boil, then turn the heat down, put a lid on, and simmer for about 40 minutes, stirring occasionally. After 40 minutes you should have a thickish goop. If it's too runy, turn up the heat to boil off some of the liquid. Add salt and Worcester Sauce to taste. Leave to cool. Sterilise a couple of juars by immersing them in boiling water for 10 minutes. When the jars and the chutney have cooled somewhat, spoon the chutney into the jars. Put the lids on tightly and place in the fridge to cool. This chutney can be eaten as soon as it is cold, but the flavour will improve over time. It will keep for quite a long time in the fridge. The video above is from the Keef Cooks YouTube channel. 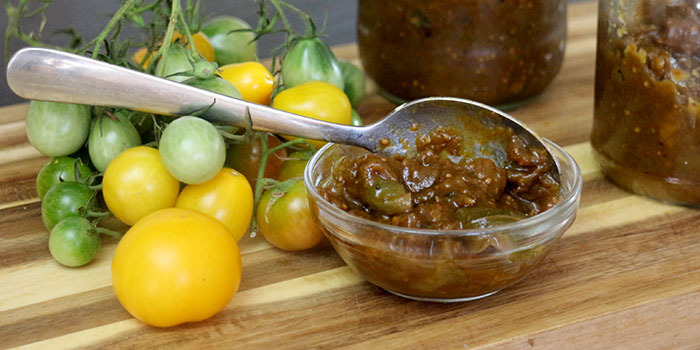 Click here to see the video recipe of Green Tomato Chutney on YouTube. Prep time: 15 minutes. Setting time: 2 hours. Total time: 3 hours 15 minutes.